Years ago, SPARC had taken up the initiative to refresh the importance of mud as construction material and to sensitize the general public in this respect. 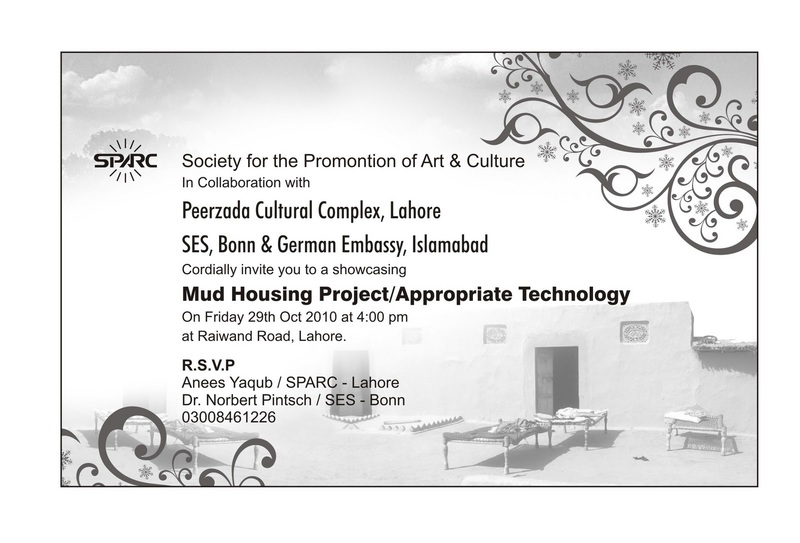 Currently, the Mud Housing Project is being implemented by SPARC in Lahore. Mud is not a construction material of the past; only steel, concrete and bricks have pushed back such useful construction material, (this is a story in itself.) Considering the enormous costs of cooling and heating the current form of buildings, it becomes quite clear that mud is environmentally friendly, energy efficient and biologically far superior than any other construction material. In order to realize the initiative, SPARC was successful in arranging foreign support as well as a local architect, who is working since the year 2000 in South Western Punjab, and together with DGFK (German Society for the Advancement of Culture, Berlin), it has been giving prizes under the Preservation of Cutural Heritage program for the best maintained Mud House, Brick House and the most interesting Design. 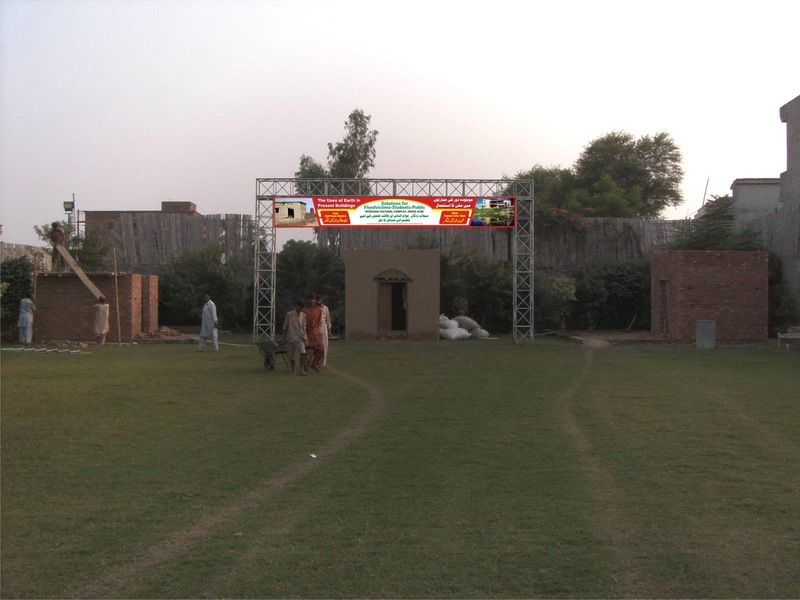 Now in the realization phase of the initiative, it was important to gather financial and organizational support as well as participants open to new ideas, which was made easier through provision of land by the Peerzada Group near their cultural complex. The planned mud rooms are to be used by the handicraft workers as sleeping quarters in the night while they work in Workshops during the day. Example of appropriate technology (solar cooker) will also be available for demonstration purpose and in order to be independant of the public technical infrastructure. This combination was also greeted by the universities Punjab University, COMSATS and BNU, who find it useful for involvement of students in practical projects like construction and physical measurements that are part of the Mud Housing Project. Generally speaking, the Mud Housing Project comes at a time of extreme flooding misery around the River Indus and therefore unintended becomes current in its own right. There are, however no demonstrated examples of the concept, which can contribute to experience and which can be adjusted for example for usage in the crisis regions. The initiative described above is small, but it has a large potential: Help in the Indus Basin flood hit areas is of course a priority, but the construction methods in the urban areas are to be examined closely in terms of energy consumption. Mud housing is normally ground floor construction, but there are also interesting mud house examples in double story construction. A project of experimental construction is therefore required for a more exact evaluation and experimentation of this and other aspects of mud housing. Pests of all kinds can attack homes at almost any time of the year. Generally, when temperatures rise, most of the pests perk up. As the weather changes and it becomes warmer, pests’ metabolism increases and they are more active. Pests that are found in and around houses can be divided in different categories: wood destroying pests (like termites), food, fabric, and nuisance pests (ants, flies), food storage pests (fungus), pests that sting, bite, or injure (bees, mosquitoes), vertebrate pests (house mouse, lizards) and many more. All of them create problems. Worst of all house pests, termites are temperature dependent. Termites initially are just a mild nuisance, but if they are not controlled at early stage they can be destructive. Of about 2000 known species of termite, most commonly found in this part of the world are known as white ants that damage wooden items such as furniture or house structures. In summers, termites can wreak havoc in homes. Termite can start their damaging activities in warmer parts of the houses even in winters as well. And here is the rub: They are hard to find even when they are digesting sub flooring or tunneling through walls of any home. And when the columns of tiny ants are seen marching across walls, the damage might have already been done. How to find these home wreckers? Walk your home's perimeter regularly, and look for hanging zigzag mud tunnels on the walls. Termites build these for covert, humid access to wood. Also look for broken off wings and sandy, wood colored termite droppings. Once termite colony (yes they live in their own colonies) is suspected, it is better to get help for professional termite extermination. But there are so many simple things that can be done by owners to prevent termites or at least lessen the possibility of getting termites. Preventative measures include making sure the wooden parts of houses have no direct contact with the ground. This means keeping walls free of dirt piles, not letting trellises or plants grow from the ground to the siding, and not stacking wood against the house. Even thick wood mulch can provide cover for termites. Also keeping moisture away from the foundation and immediately repairing all types of leaks around structural wood is useful. Paying particular attention to wooden decks and stairs, and areas where the structure rests on the foundation walls, and especially in crawl spaces or any area with an earthen floor also helps detect the attack. Earlier, building owners and construction people concerned about termite control should start at the planning stage. The first thing to consider is the type of foundation a building is going to stand on or will be resting on - some of the foundation types have more potential for termite problems than others. Other factors to consider are timing of treatment (pre-construction or post-construction), type of treatment (liquid or feeding stations) and good building management practices. Beside termites, cockroaches are the hardiest (and for some the scariest) of all the house summer pests. Cockroaches are active in the night mostly. If one spots any in the daytime in kitchen or bathrooms, it means the house is infested with cockroaches. Cockroaches damage the health of the family member by spreading microorganisms. Cleanliness and good sanitation in homes can reduce their menace. To prevent cockroaches from entering the house, seal all the gaps that can allow them access to your home from outside. Do not leave anything that it can feed on in the open. This is a difficult task as they eat almost anything and everything. Black ants that commonly infest the houses are the smaller variety often called sugar ants. These ants eat sweets and oil and normally infest the kitchen. To prevent them from attacking your kitchen keep all the food in containers, clean the counter tops at regular intervals and empty the garbage cans frequently. The best way to eliminate these ants is to eliminate any source of their food. Bees (yellow or black locally called demoon) are also common in summers. These flying insects have a nasty sting that causes swelling and pain and even can land anyone in hospital if attacked by more bees. House flies and mosquitoes are also damaging and swarm more in summers. House flies not only rate high as a nuisance, but are a constant threat to health by carrying disease organisms from filthy habitats to contaminate food. Flies may carry bacteria on their bodies which can then be transferred to food. They breed in garbage, grass clippings and in other decomposing plant and animal matter. Maintain trash containers with tight-fitting lids and regularly clean up dog feces in the yard. Keep doors and windows closed unless equipped with tight-fitting screens. Different repellent and electric mosquito and housefly terminators are also available in market. All season pests like rats and cecak (wall lizards locally known as chapkalli) scuttle about in dirty places and can track filth in if you do not block their access into your living environment. Rats not only spread disease, but are also a nuisance as they like to chew through doors, window screens, cables on appliances and computers, electric cables in your attic and even cars where the seats become their nest. Cecak are actually quite helpful creatures as they consume mosquitoes, house flies and some other pests that live in homes but most people do not like them scurrying about the walls and ceilings of their home. People use different types of chemical substances or mixture of substances to destroy, repel and mitigate the house pests. Indiscriminate use of chemical substances can also be an environmental problem or out rightly dangerous for children (remember incidents when kids have been reported to eat up poisonous pills kept for killing house rates (chohe mar golian). Therefore, utmost care has to be exercised while using any chemical substance at home. All the home pest insects cause damage in one form or the other in every season. There presence is a nuisance at best and destructive for material and unhealthy for human at worst. They look ugly and make the environment is homes unhygienic and unaesthetic. Inspecting house carefully and looking for telltale signs of infestation at all times and terminating them before any damage is the best strategy. Precautionary measures should be taken anyway. If there is an infestation that can not be dealt with personally, one should never take it lightly and professional pest controller help should be sought immediately. And there are other type of ‘pests’ that can not be controlled what to talk of termination. Unwelcome guests and or in-laws can come in home anytime with full clams. What to do when these pests invade your home? Over to you. Tell me?